On July 13 Baxter Dmitry claimed that a former CIA agent, Malcolm Howard had confessed when he learned that he had only weeks left to live, that the CIA blew up WTC tower 7, the third building that was destroyed on September 11, 2001. It is of course highly questionable whether this story has a reliable background or not. Baxter Dmitry, as it turns out, does not seem to be a reliable source of information. However, in this case, it is of no importance. What matters is that the entire hoax of 9/11 has now come back into people's attention. It was front-page news for a few days, even though of course not on the MSM, the mainstream media. It did in the meantime become far too obvious to the public that Al Qaeda would never have been able to pull off such a monstrous and gigantic set of events. The truth is more likely that the Saudis and Mossad, the Israeli Intelligence Agency, were the ones who carried out the horrendous deeds on that fateful day that was going to change the course of history -- most likely on the initiative and the backing of the U.S. government. It is, however, starkly clear who has benefited from this catastrophe. It opened the way for the neocons to start the wars that have all been in the name of anti-terrorism, in spite of the absence of proof of any terrorism whatsoever. Washington has always been the supporter of terrorism and if they claimed to fight 'terrorism' it was always a smokescreen to hide the real fact that they were heading for regime change or utter destruction of a sovereign nation -- or just intending to install fear and meekness in their own people. The word 'terrorism' became current usage after 9/11 and it has served Washington extremely well. Let us see what really happened. Planes took off from Logan Airport, Boston, from Dulles Airport, Washington D.C., and from Newark International Airport. At some point in the air the planes changed their planned flight route without any air traffic controllers taking notice or warning some central command. That alone is unheard of. As soon as a plane leaves its planned flight course, the air traffic controllers get into action. Unless they have been told under strict orders and heavy threats to do nothing. 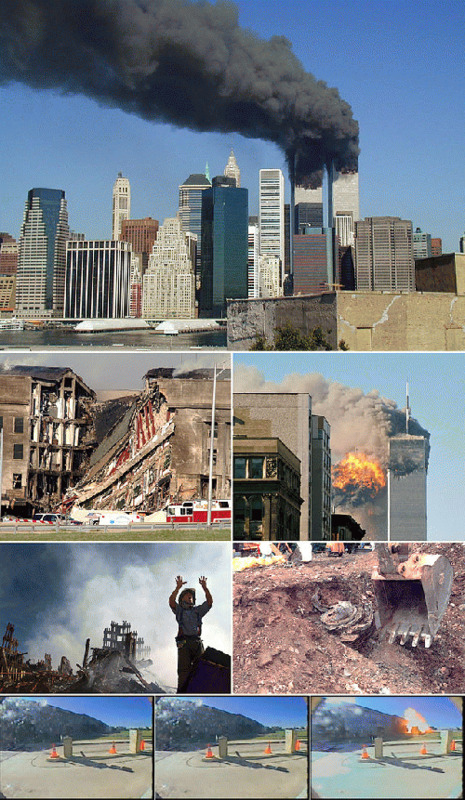 Secondly, NORAD, North American Aerospace Defense Command, did NOTHING as hijackers all over the eastern coast took over passenger planes and crashed them into WTC towers, the Pentagon and, due to fighting in the cockpit (according to the official story), crashed in Pennsylvania, 80 miles southeast of Pittsburgh. An important addition to the points I have already made is what whistle-blower, Major General Albert Stubblebine III, says in the video, (Published on Apr 1, 2017 -- mentioned several timesagain below) "All of the air defense systems in that part of the country had been turned off that day -- ALL of the air defense systems had been turned off. Why? Apparently because the Vice President was out in Colorado, and he ordered them turned off." End of quote.